We combined the record-narration, sync-animations, and add-annotations tools into one streamlined window in Presenter 360 to speed your workflow. And we added a new timeline so it’s easier than ever before to manage your audio, animations, and annotations. The ribbon runs across the top of the window and includes buttons for working with audio, animations, and annotations. You can hide the ribbon by double-clicking the Record tab. Double-click it again to restore the ribbon. The slide stage is located in the middle of the window. It’ll automatically adjust to fit the available space, depending on the size of the surrounding panels. The slides panel is located on the left side of the screen. It displays a thumbnail image for each slide in your course and lets you switch between slides. The timeline panel runs across the bottom of the screen. It gives you a visual representation of each slide’s narration, video content, animation markers, and annotations. The notes panel is located on the right side of the screen. 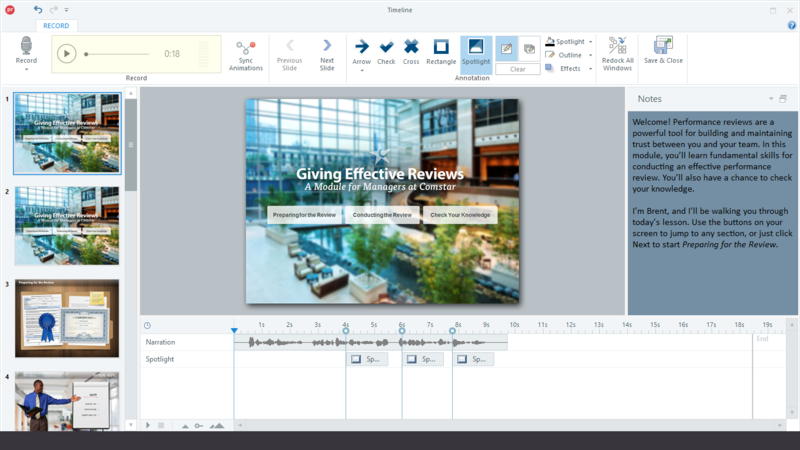 It’s synchronized with the notes panel in PowerPoint, so you can use your notes as a script while you record narration and sync animations. You can undock the notes panel and move it to another monitor when you need more room to work, then redock it when you’re done. You can also change the color of the notes panel background and text to make it easier to see how your notes will look if you include them in your published course. The consolidated narration window will open to the slide you’re currently viewing in PowerPoint, but you can switch to a different slide by selecting a thumbnail in the slides panel on the left. You can resize the slides, timeline, and notes panels when you need to focus on certain features. You can also close panels altogether to move them out of the way, then reopen them when you need them. To resize a panel, just drag its boundary. For example, to make the timeline panel taller, drag its top boundary upward. Drag its boundary downward to make it shorter. To close a panel, drag its boundary to the edge of the screen. For example, drag the left boundary of the notes panel all the way to the right side of the screen to close it. To open a panel that was previously closed, just click its title bar on the edge of the screen. Need more room when you’re using the notes panel as a script for recording narration? Just undock the notes panel and move it to another monitor. To undock the notes panel, click its title bar and drag it to a new location, or double-click the title to pop the panel out. To redock the notes panel in its original location, click the Redock button in the panel’s upper right corner. Another way to redock the notes panel is to click Redock All Windows on the ribbon. The notes panel in the consolidated narration window is synchronized with the notes panel in PowerPoint. As a result, you can add or edit notes in either location, and they’ll be updated immediately in the other location. The notes panel in the consolidated narration window window can be helpful when you need to read from a script while recording narration. The notes panel might not be white with black text like the rest of the screen. We wanted to make it easier to see how your notes panel will look if you include it in your published course. The notes panel colors are controlled by your player properties. See this article to learn how to change the notes background color. Zoom into the timeline panel for precise editing, or zoom out to get a big-picture view of the current slide’s entire timeline. Drag the zoom slider left and right to change your zoom level. To change the duration of a slide, just drag the End marker left or right in the timeline panel. If the slide you’re editing has audio or video content, you can’t decrease the slide’s overall duration, but you can increase it by dragging the End marker to the right. To preview a slide, use the play/pause button on the ribbon or the play/pause button in the lower left corner of the timeline panel. Syncing animations has never been easier. Use the Sync Animations button on the ribbon to set your initial timings, then drag the animation markers in the timeline panel to tweak them. Annotations let you highlight important slide content at just the right time with arrows, checks, crosses, rectangles, and spotlights. Annotations have been redesigned in Presenter 360, making them more powerful and easier to use. You can now add and edit annotations without having to re-record an entire slide. Use the features on the ribbon to add and format annotations, then use the timeline panel to adjust their durations and timings. See this user guide for details. When you’re finished working in the consolidated narration window, click Save & Close on the ribbon to return to PowerPoint. Or, if you want to close the window without saving your changes, click the X in the upper right corner.